In a previous article I described those waterfalls nearest to the populous end of Tobago. The following falls are further away and require a bit of driving time. The Windward road heading for Speyside : Goldsborough river and the Two Rivers waterfall. After the village of Goodwood the road flattens out passing both primary and secondary schools. There is a black and yellow painted bridge and after this is a left turn called Pig Farm Road. Follow this to the point at which the road turns sharp right with a lot of Bamboo on the right. Park here and take the old track down to the river. Follow the river upstream and keeping with the right tributary where the river splits you will come to the Two Rivers waterfall with a large swimmable pool below it. Should you wish for a guide follow the main road past Pig Farm Road, cross the new bridge and turn down at the sign for the Pembroke Heritage village. There is the office of the representative there and you may be lucky to meet the young man who will take you up river for a small fee. Richmond River : There is a waterfall here deep in the rainforest. This is best done with a guide and a group of two or more as there are parts that are difficult and the river can flood with great speed. This is the river that I personally do guided tours to. Argyle River and Waterfalls: This is easy to find as it is both well signposted and there are guides eager to assist you. Follow the track into the carpark, pay the entry charge and should you require a guide, get him or her here. Do not bother with the people and the start of the road in. The walk to the first of the waterfalls is easy enough but you can climb right up past several other falls and get to deep pools at the top where you will be alone, away from the crowds and be able to enjoy swimming. This is the reason for having a guide! Louis D’Or River: At the far end of the village of Louis D’Or there is the Government Nursery. This is interesting to visit and has a pleasant woodland garden at the end on the banks of the river. Shortly after this there is a turning downhill. Take this and follow the road until you get to an obvious place to park the car. Follow the road and you eventually get to a ford. Either turn downstream and follow the river for a pleasant walk until you see where you parked the car, or follow the river upstream. There are no falls on this river within at least an hour and a half walking. But is a pleasant walk through woodlands and grassland. Kings Bay Waterfall: Easy to get to, simply drive through Delaford, down the hill to the car park at the bottom. Leave the car here and walk the concrete track to the falls. Sadly they are a shadow of their former selves as the construction of a dam at the top has cut the water supply dramatically! They can be climbed, but with difficulty! The Northside Road. 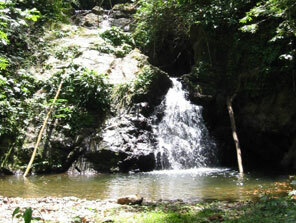 Englishman’s Bay Falls: The river on the opposite side of the road to the entrance to the beach has a tributary. Follow this along the bank, through the river and get to a point where the bamboo and cocoa trees crowd down to the river bank and shortly after this is a small fall which can be climbed but it is not that easy. No swimming pools I am afraid. Follow the main river and after sloshing your way upstream you come to a big waterfall. There are other falls above this and the only way up appears to be use of the left bank. This is not easy. There is however a track right at the top and should you find where this comes out you can access all the falls by following them down. Again not an easy trip! Parlatuvier: My favourite spot! The track opposite Jetty Street which turns left off the main road, leads to the river and following this upstream for five minutes brings you to a small fall which can be climbed. At the base and above are small swimmable pools set in a dense forest. It is an exquisite spot. There is another waterfall off the other river which goes under the road close to the restaurant. There is a small shed on the roadside and going down behind this takes you into the river. Getting to the main fall is quite difficult in parts as some unkind god has placed large rocks in positions which means having to either circumnavigate them or climb over them. Not for the faint hearted! Bloody Bay: I read recently that there are supposed to be five falls on this river. I spent quite a long time navigating the lower reaches of this river and saw no signs of hills let alone waterfalls within an hour walking upstream. However there is somewhere in L’Anse Fourmi, a track that takes you through the old plantations and down to the river. This would provide an easier means of access to the river as there is so much long grass and other obstacles to going up river from the main road! To get to the river, follow the main road from Paratuvier and turn left at the T junction (right takes you over the rainforest to Roxborough). Downhill from here and you come firstly to the each track and then form there you can see the bridge. It is possible to drive someway upstream on the other side of the bridge, before leaving the car and continuing upstream on foot.